The sweetness of strawberries and red clover (Trifolium pratense) combined with the almond-y, honey flavor of meadowsweet (Filipendula ulmaria) flowers and the aromatics of meadowsweet seeds make for a delicious shrub. Strawberries are well known for their vitamin C content and high antioxidant levels. The unfiltered apple cider vinegar is packed with potassium and live enzymes, and helps to promote youthful skin, regulate calcium metabolism, lower blood pressure and cholesterol, aid digestion, and reduce chronic fatigue. It can also aid weight control. Not bad results from one ingredient! Letting the shrub ferment gently over a few days means it can also improve your digestion and help colonize your gut with healthy bacteria. Strip the meadowsweet blossoms of stems and stalks, and set them aside in order to give the wildlife plenty of time to disperse. Put the strawberries in the sterilized jar. Add the clover and meadowsweet flowers, and meadowsweet seeds (if using). Using the end of the wooden spoon or muddler, lightly crush the fruit, blossoms, and seeds. Add the honey and vinegars, and stir thoroughly to combine. It is important that you cover the jar with a glass or plastic (i.e. nonreactive) lid. Alternatively, if you are using a canning jar that has a metal lid, put a piece of parchment or waxed paper between the vinegar and the lid, to prevent it from corroding. Put the sealed jar in the refrigerator to infuse for 1 week, shaking gently every day. Fine-strain the shrub into a wide-mouthed pitcher and funnel into the sterilized presentation bottle(s). Store in the refrigerator and consume within 6 months. To create a delicious drink, simply mix ½–1oz (15–30ml) of the shrub with 8oz (240ml) sparkling water in an ice-filled highball glass. 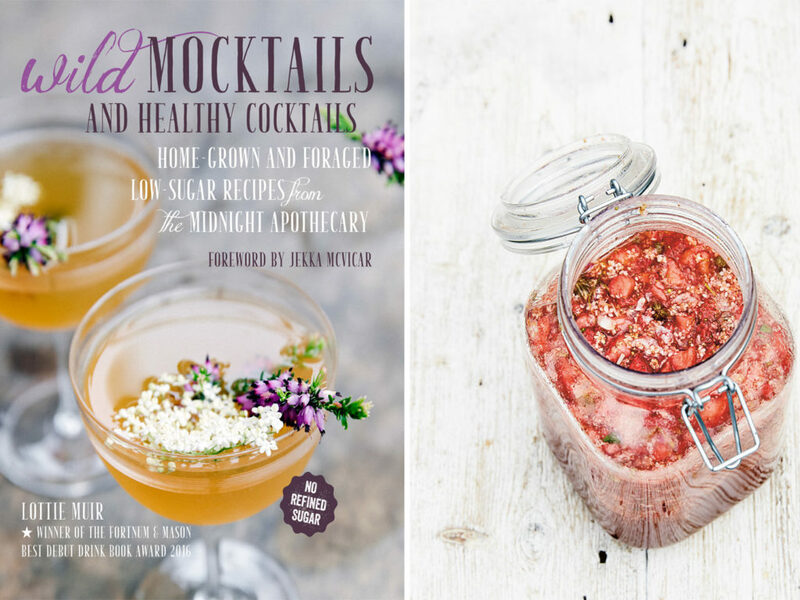 Excerpted from Wild Mocktails and Healthy Cocktails by Lottie Muir. Copyright © 2018. Photographs by Kim Lightbody. Used with permission from CICO Books. This original article first appeared in the Summer 2018 issue of City Style and Living Magazine.